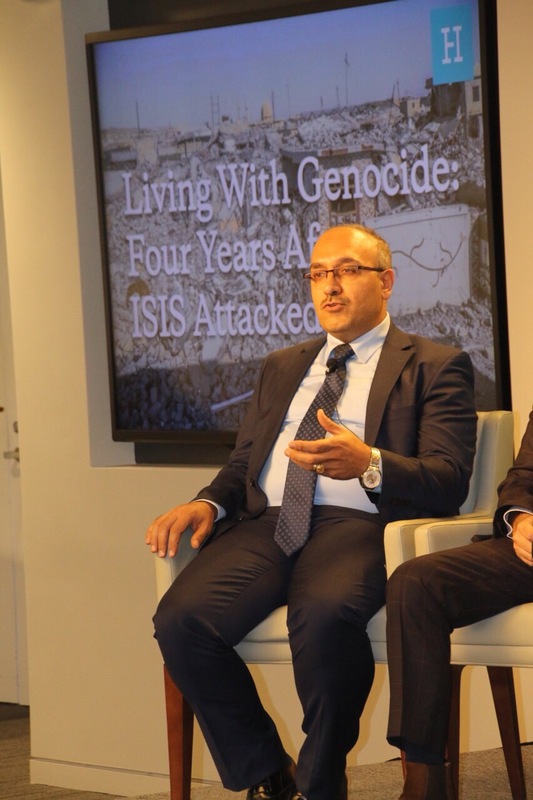 On August 3, 2018, in Washington DC, Mr. Ashur Sargon Eskrya participated in a panel discussion "Living with Genocide: Four Years After ISIS Attacked " organized by the Hudson Institute and co-sponsored with the Religious Freedom Institute, discussing the current state of ethnic and religious groups which was attacked by ISIS in the Mosul and Nineveh attacks in summer 2014, with the participation of Hon. Dr. Fareed Yasseen, Iraq’s Ambassador to the United States and Hon. Bayan Sami Abdul Rahman, Kurdistan Regional Government (KRG) Representative to the United States. Kent Hill, executive director of Religious Freedom Institute; Pari Ibrahim, Board Director of Free Yezidi Foundation; Sherri Kraham Talabany, President of the SEED Foundation; Douglas Padgett, Senior Advisor at the Office of International Religious Freedom; and Loay Mikhael of the Iraq Haven Project. During his participation in the Panel, Mr. Ashur Eskrya spoke on the many genocides that the Assyrians suffered in the previous periods and to the most recent genocide on 6 August 2014, which affected our people in the Nineveh Plain.